Good grief. Another one goal effort by the offense. It has become ridiculous recently. Last night, despite playing an entertaining game, the Rangers could only net one against the Columbus Blue Jackets. Steve Mason played well with 32 saves but he was helped by at least 2 goal posts when he was beaten. One goal v. Pittsburgh, one in Nashville (but a shootout win), 1 vs. the Isles (plus an empty netter), one SHG (Prust) v. Ottawa, and one PPG (Staal) in Columbus. Where are the main line scorers? I have no idea. You will not win many games that way especially of your allegedly world class goalie keeps giving late game soft goals like last night and last Sunday. So even though the Rangers have a solid record, they are leaving points on the table just like last year when they blew games late and left OT points behind. Something in common from this year and last -- lack of late game offense (the Rangers rarely ever score a goal to extend a lead or take a lead late in the game) and lack of late game solid goaltending. My fingers are loathe to type the same stuff over and over and over again. I am told I am too wordy; I don't want to be accused of being repetitive but. . . . The game had plenty of skating, hitting, several posts and some decent goaltending. The Rangers hit a couple of those posts which cost them the game. They outshot the Bluejackets but that was deceiving. Again, the Rangers got dominated on faceoffs, at one point losing 25 out of 30 for a final deficit of 33-23. That's no way to continue possession in either the offensive or defensive zones during the game. far to celebrate after scoring from an oblique angle. Abysmal. The Rangers and Bluejackets exchanged power play goals in the second period. 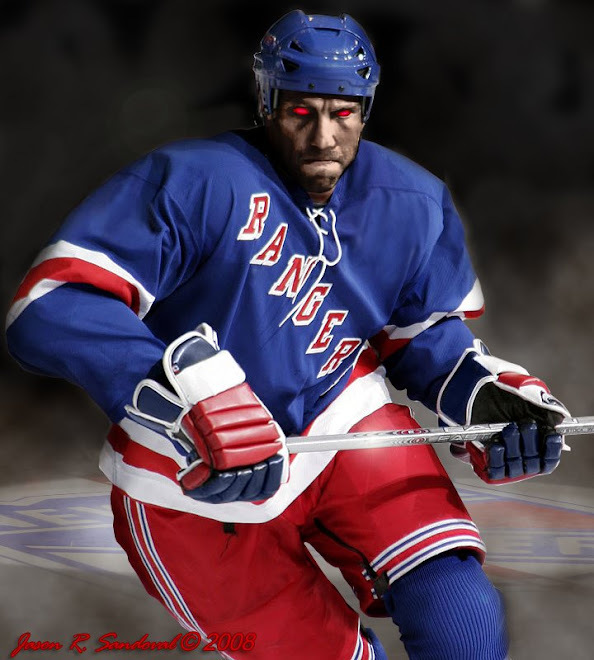 The Rangers came from Marc Staal at the 9:53 mark. That tally was matched by Anotoine Vermette 5 minutes later. Then the 3rd period became the Rick Nash show when he scored his 15th and 16th goals of the season. The game winner came with less than 5 minutes to go after the Rangers were pressuring in the Blue Jackets zone. The puck squeezed outside the zone, barely evading one Ranger trying to keep it in. Nash rushed up center and as he came down the center, Marc Staal stumbled to the ice forcing Nash to go into the corner on Lundqvist's left. Henrik had the post covered but Nash shot anyway from an impossible angle and the puck found space between Henrik's pad and the goal post and slithered through. Very reminiscent of the game winning goal by Chris Kelly for Ottawa last Sunday night -- same post, difficult seeing-eye shot that should have been stopped but still lit the lamp. The Rangers were given a power play opportunity shortly after that they failed to do anything with. With less 1:20 remaining, Lundqvist was heading to the ice as the Rangers had gained the Blue Jackets zone. But Nash outclassed Staal again at the blue line as he used his long reach to poke the puck past Staal outside the Ranger offensive zone. To put the proverbial cherry on this game Nash totally outraced Staal down the ice as the defenseman vainly slid across the ice to try to stop him. Nash was not finished as he approached Lundqvist and totally undressed the goalie to beat him to his gloveside with a backhand. The game mercifully ended before Nash could complete a hat trick in the final five minutes of the game. Nash makes it 3-1 with 1:16 remaining. It is hard to pinpoint the problem: the team was scoring nearly 3 goals a game before Marian Gaborik returned. Since his return, the scoring has become sporadic. He has had 2 hat tricks but he is invisible offensively most games. Perhaps he is being marked closely but that does not stop other goal scorers like Crosby, Nash, etc. Sean Avery continues to be extremely erratic. Last night, we saw the abysmal Avery. At least 2 offsides on the rush (and they were not close calls), and during the 3rd period, he made at least 2 egregious passes in front of Henrik that were intercepted and led to serious scoring opportunities. You knew they were egregious when the Ranger announcers sighed audibly. I have no idea what fellow fans see in their ill-conceived write-in campaign to have him as an All-Star. I don't care if he is cute or dresses well. You can say that about Henrik as well. They may want to focus on what makes them famous -- playing in the NHL. I do not want to cast too many aspersions here but 2 of the Russian players have been terrible -- Anisimov has one point since the Eisenhower administration. Frolov had one good game against Edmonton and is stuck on 5 goals. The team cannot afford any offensive zeros out there. Not when Marc Staal has as many goals as Frolov and Fedotenko. After Saturday night's loss, the New York Rangers are now 17-13-1 with 35 points in the Eastern Conference. They are a solid 3rd place in the Atlantic Division, behind Pittsburgh (1st) and Philadelphia (2nd). Next up is tonight at home vs. the Washington Capitals, a team in a down spin.